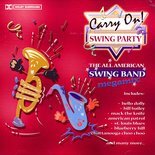 Medley 1: American Patrol, In The Mood, Mack The Knife, Sweet Georgia Brown, Hello Dolly and others. Medley 3: Chattanooga Choo Choo, Five Feet two, My Blue Heaven, The Blue room and others. Medley 4: Tea For two, Bye Bye Blackbird, I've Found A New Baby, Pennies From Heaven and others.